Earlier this year I was given the opportunity to create my first piece of hand-painted lettering, which now hangs at The Artful Room in Nightcliff, Darwin. 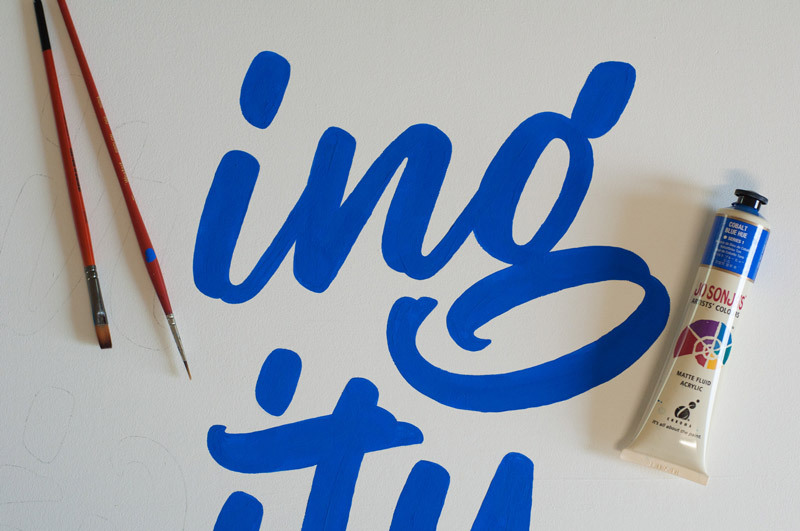 I was approached by Carla Russo – owner of The Artful Room – about creating a lettering mural for one of her walls. 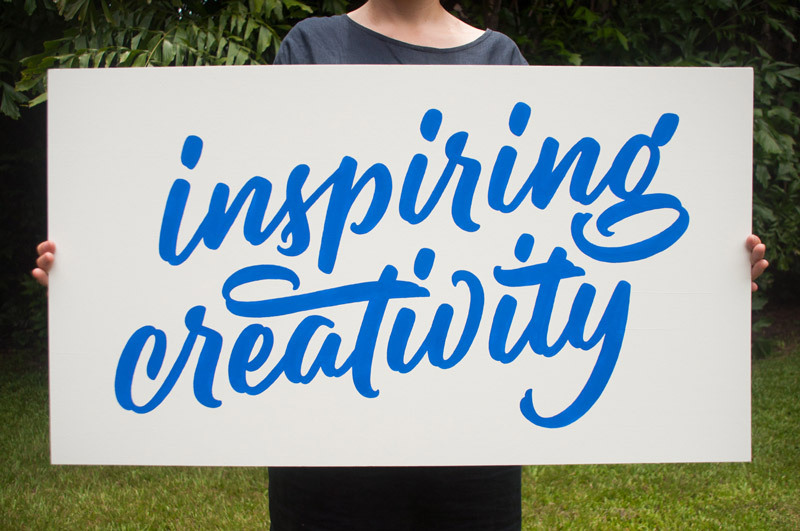 The wording for the mural was to be ‘inspiring creativity’, and the size would be approximately 900mm x 450mm. In this post I’m going to walk you through the process, from post-it-note sketch to final piece. Like most lettering projects, it didn’t start off looking pretty. This one began with a rough post-it-note sketch. 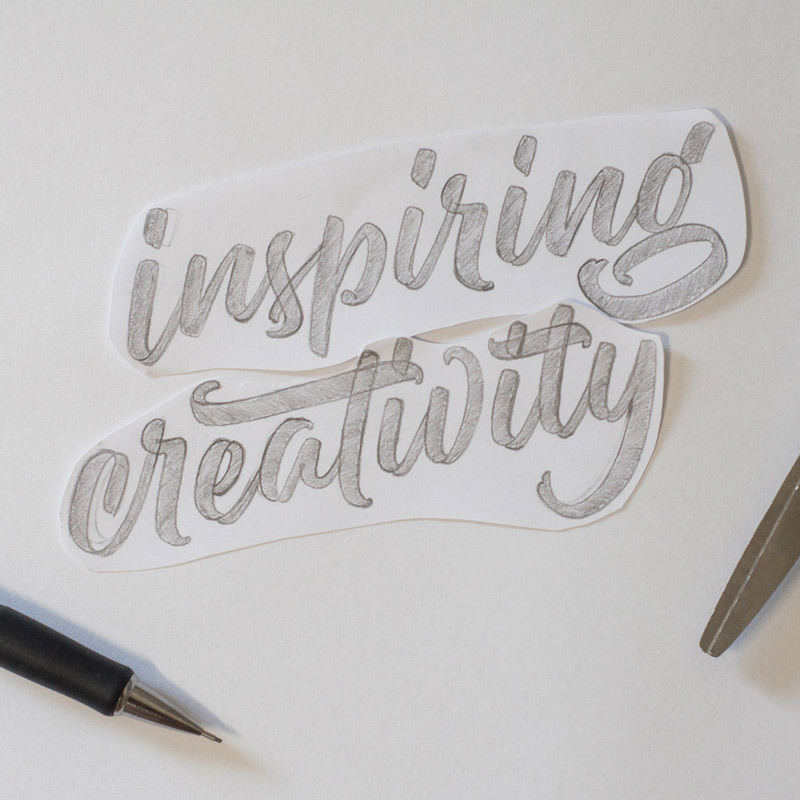 From there, I started exploring lettering styles and compositions with quick pencil sketches. The goal here is to get a bunch of ideas out quickly, not worrying too much about how they look. I then took my Tombow brush pen and, using my pencil sketches for reference, began recreating the compositions. 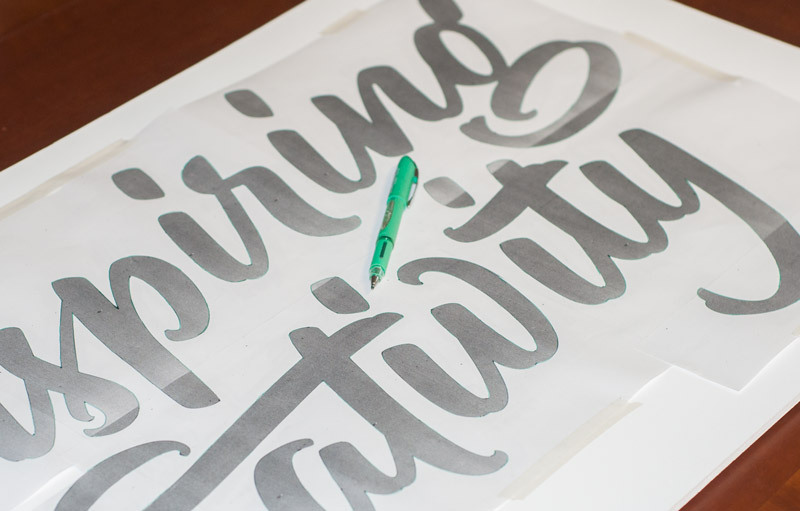 I used fairly quick pen strokes in order to achieve natural and expressive letterforms. I was pleased with my brush pen sketches, so I moved on to the next step – tracing and refining. Using a pencil, I traced the brush pen letterforms with the aid of a lightbox. During this process, I refined and tweaked individual letters, while improving things like kerning, baseline, ligatures and swashes. One of the main challenges I had during this project was trying to achieve a balanced and visually pleasing composition. 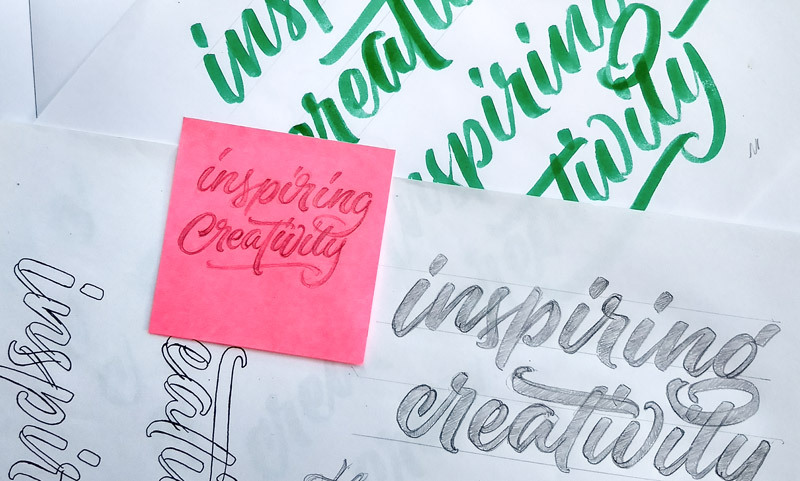 This was because both words – ‘inspiring’ and ‘creativity’ – are fairly long words, and almost the same length, which makes them harder to work with. 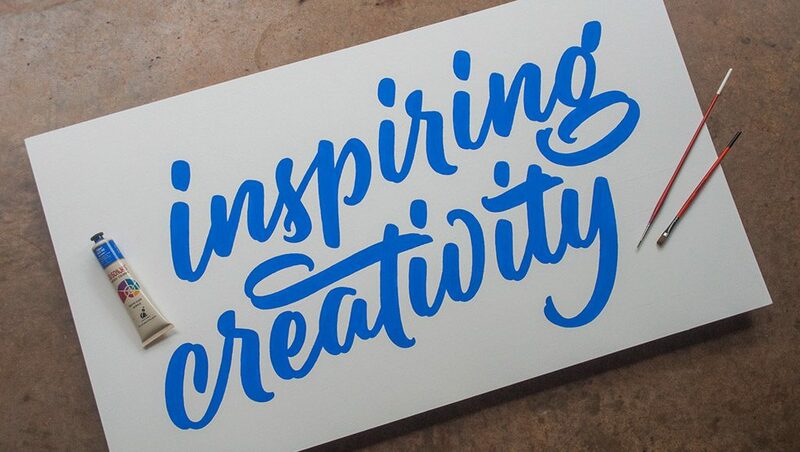 The lowercase ‘g’ in ‘inspiring’ also presented an obstacle, because it got in the way of the word ‘creativity’. To solve the composition issue quickly – without redrawing the letters – I used the good ol’ method of cut and paste to play around with the words until I was happy with the layout. Once I had a composition I was happy with, I inked the pencil sketch using a fine liner, and then scanned it. I tweaked the scan a little in Photoshop, and then brought it into Illustrator, ready to redraw using the Pen Tool. Place scanned lettering on a background layer and lock it, then use a second layer for vectors (this is really simple, but it’s helpful to be able to lock and hide the layers as you’re working). Using the Pen Tool, start placing anchor points on the outer-most and inner-most parts of each letter. This forces you to use less anchor points, which simplifies your lettering and helps with tweaking later on. When placing anchor points, click and drag while holding shift. This keeps your handles at 90° and creates smoother curves. 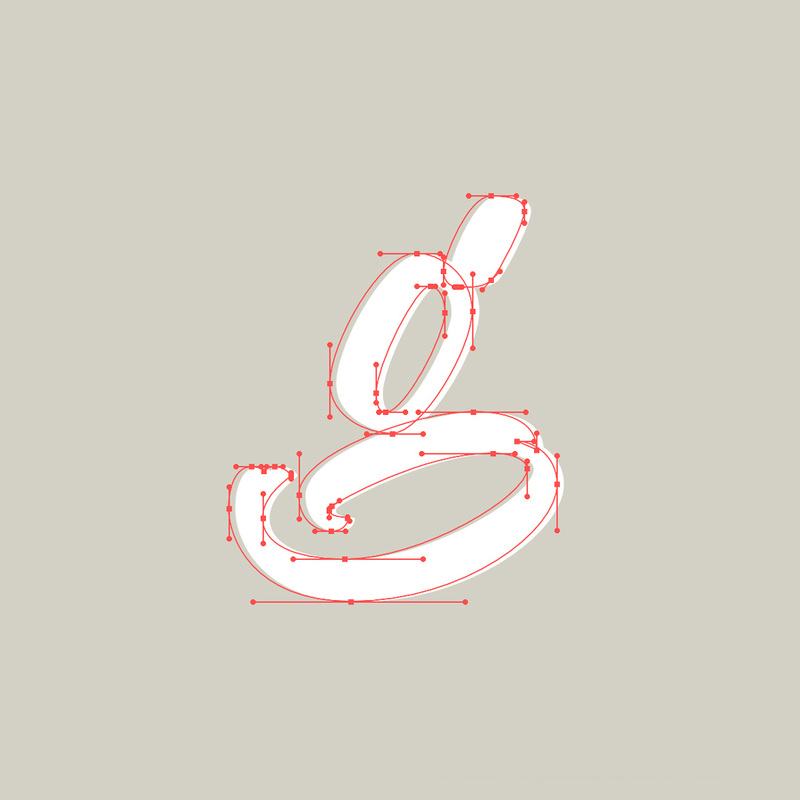 Use guides for baseline, x-height, and angle/slant to keep your lettering consistent. As with most things in life that are worthwhile, vectoring in Illustrator is a skill that requires patience and practice! 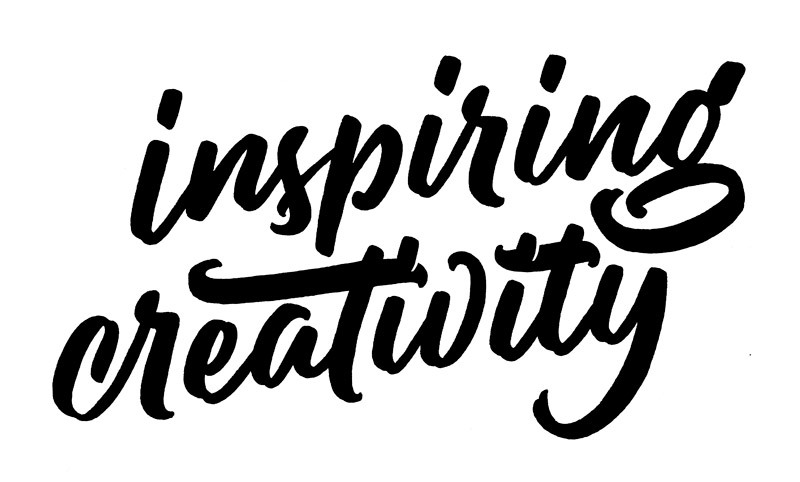 After tweaking bezier curves in Illustrator for a couple of hours, I had a piece of lettering which maintained some of the character of the original brush pen sketches, but also improved on them in many ways. By this stage, Carla had decided that she didn’t want the lettering painted directly onto the wall. Instead, we painted a piece of plywood the same colour as the wall, and this was to be my canvas. Next, I needed to get the lettering from my computer onto a piece of plywood. To achieve this, I printed the lettering at full size by tiling the design onto nine pieces of A4 paper, and piecing these together. I then used the simple (but effective) transfer method of colouring the back of the tiled paper with graphite, and then placing the plywood behind the paper and tracing the design (on the front of the paper) using a ball-point pen. My lettering was now successfully transferred onto the plywood, ready for painting. Note: Transfer paper would have made this step much quicker, but I didn’t have any. I must admit, I was incredibly nervous about this step. I had never painted lettering, or anything really, with a paint brush. And being left-handed, I knew it would be a challenge not to smudge the paint. But at the same time, I had years of practice with a brush pen, and I was confident that my hand would be steady enough. To overcome my fear of smudging the paint, I decided to work right-to-left, instead of the usual left-to-right. That way my hand would be moving away from what I had just painted, instead of over the top of it. I also used a sheet of paper to rest my left hand on, so that I wasn’t smudging the pencil guidelines as I moved along. Early on, my paint strokes were very wobbly. I was so nervous, that I had trouble controlling my hand. But I still managed to stay (mostly) within the guidelines that I had traced onto the plywood, and after an hour or so I was feeling more confident. After about four hours, I was finished. It took much longer than expected, but it was absolutely worth it, and the time flew by! I can’t describe the sense of pride in finishing my first piece of hand-painted lettering. But it’s not just the final piece that is satisfying – it’s the whole process. It started off as a quick post-it-note sketch and now hangs as a finished piece at The Artful Room. I also discovered that I really enjoy painting lettering. 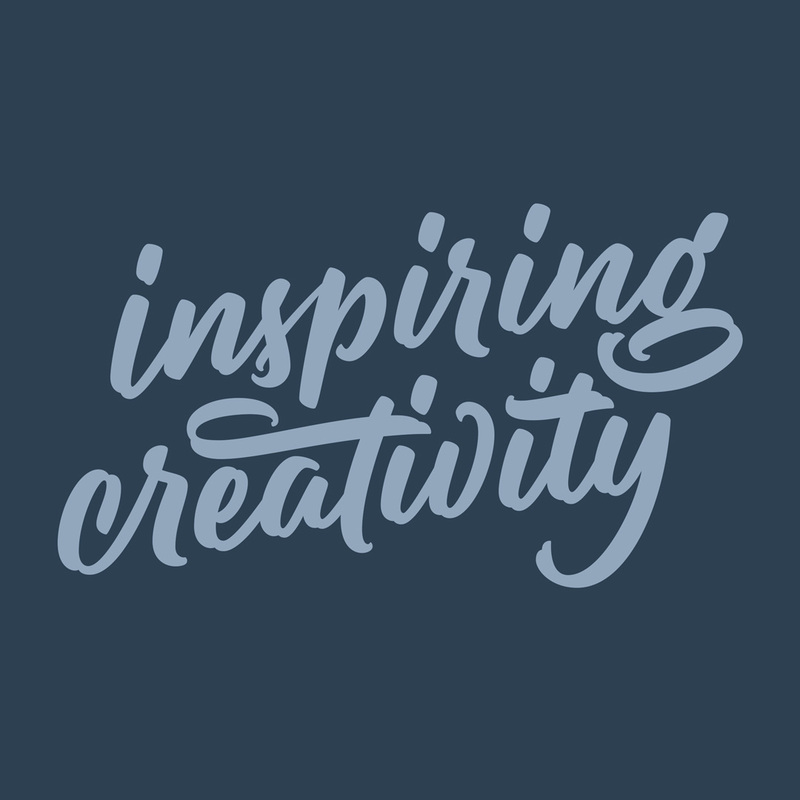 It gave me the chance to get off the computer, make something with my hands, zone out for a few hours, and develop new skills – what’s not to love?